You’re basking in sunlight. You’re rocking a novelty American flag tank top. And your fictional golden retriever, Johnny Rico, is doing backflips to impress your cute neighbor who was drawn to the intoxicating smoky aroma coming from your yard. Grilling season is the true most wonderful time of the year. But all too often, we take the road most traveled and relegate our grills to steaks, or burgers, or sausages, forgetting the Wild West, pioneer, messing-around mentality that makes cooking outside so fun. Life’s too short to be basic and obvious. 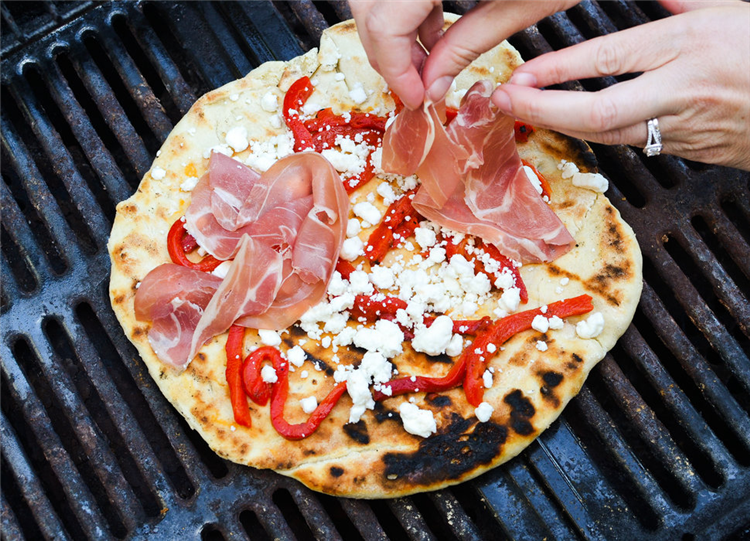 I urge you -- no I challenge you -- to get weird and throw some pizza on the grill this summer. 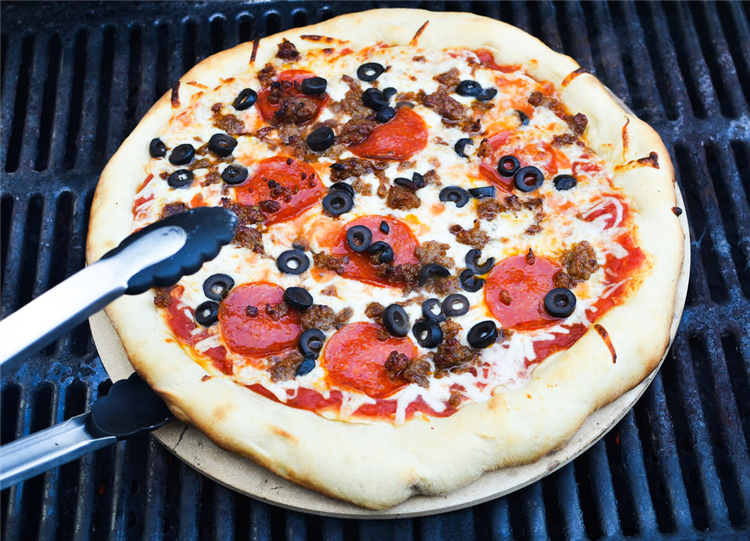 Grilling pizza isn’t easy, but nothing worth the effort (except for Easy Mac) ever is. The difficulty of pulling off a perfectly grilled pizza is what makes the end result so rewarding, and when you taste that deliciously char-kissed crust, you forget about any of the hardships along the way. A quick primer on grilled pizza theory: When a typical pizza goes into an oven, it’s being cooked with indirect heat, which is to say it’s the hot air around it that’s actually doing the cooking. Obviously, grills use direct heat. This seems like a problem. However, since pizzas are typically cooked at such a high heat -- a thin-crust Neapolitan might be in an 850 degree oven for only 90 seconds -- your grill is almost better suited to create those conditions than a standard home oven. As long as you know the tricks to employ and the traps to avoid, you can have some beautifully charred pizza in no time. I’ve outlined the three different paths to grilled pizza success, all of which have their own merits and pitfalls. It’s like a choose-your-own-adventure novel, except all of the endings have pizza, so there are no wrong choices here. Note: All the pizzas were made with fresh dough using this recipe, but using pre-made dough from the grocery store is totally acceptable. If you’re making pizza for a group, you should totally lie and tell them you made it from scratch. Kitchen tools that only do one thing are generally useless (looking at you, Dual Breakfast Sandwich Maker), but that said, a cheap ceramic pizza stone is one of those rare unitasker exceptions. Roughly 99% percent of grilled pizza fudge-ups happen because the temperature got out of control and scorched the bottom of the crust. A pizza stone makes that more difficult to do because it’s going to absorb a significant portion of that direct heat coming from the flames. Think of a stone as training wheels for your pizza. First, slam all your burners on high and make sure the lid is closed. Since the pizza is ultimately going to be cooked with indirect heat, you want the internal temperature to be as hot as possible. Roll out your dough ball directly on the pizza stone, starting from the middle going outward, making sure not to flatten the edges, thus ensuring your pizza actually has a crust, and, you know, looks like a pizza. Stop when your crust reaches the end of the pizza stone, then top it with stuff. Grilling on the pizza stone reminds me of that crispy-bottomed, Pizza Hut-style pan pizza, so I went old-school with the toppings. Crushed San Marzano tomatoes on the base, shredded mozzarella from a bag (fresh mozz can leak a lot of moisture), canned black olives, pepperoni, and crumbled hot Italian sausage. I also added some powdery cheese from a plastic can because nostalgia sometimes trumps quality. If there’s a thermometer on your grill, make sure it’s reading at 550 degrees or above. That’s about the lowest temp you should ever be cooking a pizza. If there’s no thermometer, trust your instincts. Throw the pizza stone in the middle of the grill, close the lid as fast as you can, and don’t open it for at least four or five minutes. The more you check on your pizza, the more heat you let out, and the more likely it is to horribly disappoint you. After you hit that five minute mark, take a peek. If the cheese is all melty and the top of the crust is browned, then the bottom of your crust is definitely cooked. Use some tongs to take the pie off the stone and let it rest on a cutting board for at least five minutes -- just to let all the ingredients set -- before slicing and shoveling into your face. If the top isn’t cooked and you see the bottom starting to burn, turn off the burner directly underneath the stone, and let it go for another three minutes with the lid on. I was using a three-burner grill, but if you’re operating on a single burner, shut it off completely, close the lid, and come back in five minutes. The latent heat should be enough to finish it off. It’s possible to cook a pizza with direct flame contact, it’s just a little tricky. But it’s nothing you -- an adult with a fully functioning brain and set of problem-solving abilities, hopefully -- can’t handle. You might have to adjust your expectations of what a pizza should be. If it really makes you feel better, you can call them flatbreads. Start by greasing up the grate with nonstick spray -- do it while the flame is off, unless you want to lose some eyebrows/maybe your life -- then heat the grill on high with the lid shut. While the grill is heating, divide your dough ball in half, then roll into two separate rounds with less-defined crusts. The flatter they are, the more evenly they’ll cook. Making small pies (Giada De Laurentiis would call them pizzettes in an unnecessarily performative accent) lets your dough cook faster and makes the pizzas easier to work with. Place the dough rounds directly on the grate, trying to avoid obvious hotspots, then close the lid for about one minute to let the cooking process start. Open the lid and do a quick check-up. If you see parts of the crusts cooking unevenly, use grilling tongs to turn or otherwise shift them around. Be like a free safety -- read and react. With that in mind, don’t be afraid of a little bit of char. An appropriate amount of burn can add complexity and depth and it really makes you appreciate the dopeness of grilled pizza. Close the lid for another minute, and flip when the bottom is gently charred and you see bubbles rising to the surface. Add your sauce and toppings on the cooked side of the dough after you flip it. Since the dough cooks really quickly, it’s best to choose toppings that don’t need a ton of heat. Don’t burn your crust waiting for some mozz to melt. I drizzled some olive oil onto the crust, then added a pinch of salt, some roasted red peppers, fresh peaches, goat cheese, and prosciutto. Other cheeses that don’t need heat like burrata, gorgonzola, or queso fresco work too. When the bottom of the crusts are nicely charred, use tongs to drag the pizzas off the grill onto a cutting board and let them rest for a few minutes. Pizzas and steak -- both have to rest for maximum enjoyment. I threw some wild arugula on top of mine and drizzled some olive oil and lemon juice on top, but if you’re ethically opposed to salad on pizza, feel free to skip that. The goal here is to make sure there’s no heat coming directly from underneath your pizza, and the burners are just circulating hot air throughout the environment. Like, you know, an oven does. You can throw the pizza directly on the grate for this, but to be as consistent as possible, I like to use a circular sheet pan. It gives you just enough protection from the potential of open flame burnage but doesn’t create that cracker-like crust crispiness that often comes with a stone. For this to really work best, you need a gas grill with either three or five burners. That way, you can crank the outside burners to create the oven effect without any direct heat hitting the pizza in the middle. You can do this on a charcoal grill by arranging the hot coals around the rim and creating a cold spot in the middle, but it’s less consistent. A single-burner gas grill just can’t do it. Sorry, man. Maybe it’s time to upgrade your rig. Roll your dough ball out starting from the middle and working your way outward without flattening the edges. If you’re using a sheet pan, stretch your dough to fit snugly. My pan is 17-inches, so I ended up with a pleasantly thin crust. Top the dough before it hits the grill. I did a classic BBQ chicken -- Sweet Baby Ray’s base, shredded mozz, grilled chicken breast, raw red onion, topped with fresh cilantro -- because I think the meta-grilling theme is fun and quirky. Make sure the temperature reading on the grill is at least 550 degrees, then throw the pizza in the middle, and close the lid as fast as you can to trap in all the heat. Since one or more of your burners is off, the grill might take awhile to get back up to temp, but be patient. Don’t open the lid for at least seven or eight minutes. Unless you smell burning or see flames, then something went wrong and you should deal with that. Open the lid around that seven minute mark and use tongs to check the bottom of the crust. If one side is getting more char than another and the pizza isn’t fully cooked yet, turn the pan 180 degrees and let it run for a few more minutes with the lid closed. If you’re like me and enjoy some New York-style floppiness, pull the pizza off just when the cheese is melted and you can tell the dough is cooked through. Again, let the pizza rest for a few minutes, then slice it up and go to town.